Publishing of the future demands collaborating across the process chain, in order to successfully place the right product forms in the right markets. What kind of future publishing has is the object of a constantly intensifying debate. Just the word “publishing” invites a discussion of definitions. So let me begin with an illustration of what I understand publishing to be in the context of this article. Publishing of the future requires working together across the process chain. These days, as a rule, conventional, “traditional” publishing is described in terms of a gatekeeper function and is most certainly a top-down concept. If one compares this with the current developments in digital publishing, one has the choice of following trends and buzz words or of conceding that, for many functions and processes, there are as yet no suitable terms — terms which are on the one hand unambiguous and on the other sustainable. So, above all, it’s a matter of understanding the functions which were depicted in organizational diagrams as roles in order to understand their new relationships and to arrange them into conceivable processes. An important requirement for this understanding has to do with content, or more precisely, with granular content. If content is ready for production, i.e. for creating products, this content has been prepared, but not structured. In the established product forms, it is supplemented with metadata according to the ONIX standard, i.e. author, ISBN, number of pages, price — that which is recognized as metadata in current distribution channels. The illustration below demonstrates what granular content structures are. 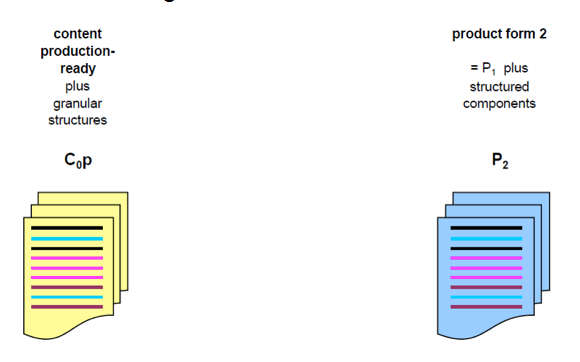 Content elements carrying individual meaning are not only separated from each other, they are also labeled with tags; these tags are content-related, i.e. they contain content-related metadata, so they help identify, structure, and find content on a granular level. It is now possible to create different versions of this content with various combinations of these granular elements. This can be done either by the content provider or by the user. These versions are the basis for different product forms each customized for use in a given environment. The number of versions/product forms is not limited, in theory (in practice, there are technological limitations). On a content level, the keywords are authors, editors, producers, and aggregators or syndicators. These terms reflect various stages in the processing of content and they have different functions in the achievement of process goals. Taking this into account, it is no longer difficult to imagine these functions as roles, which — complementing one another in a collaborative way — contribute to the overall goal. In this context, it is worth noting that, from a role perspective, two functions are becoming increasingly interchangeable, depending on how they are defined and positioned in the course of the process: the function of the editor and that of the producer (a key factor is, of course, whether editors have an affinity for technology and whether producers are interested in working on texts). 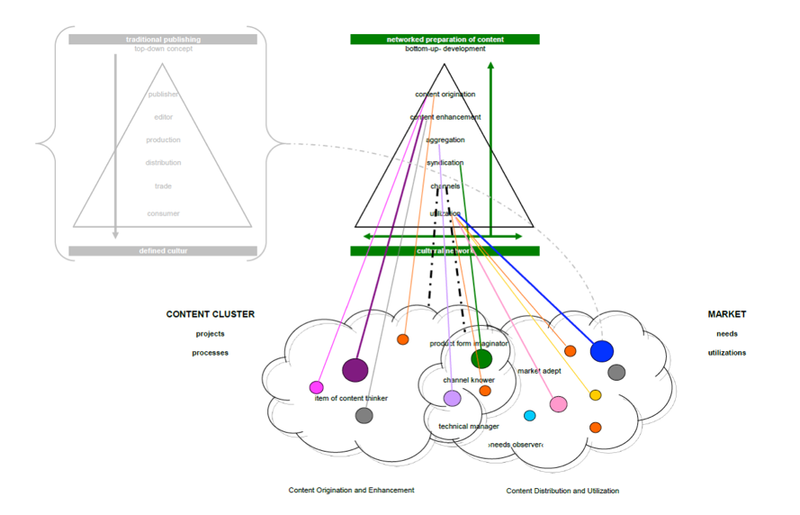 Both can analyze the structure of the content as well as integrate the metadata based on these structures. However, we know that editorial departments, to date, are not designed to cover these functions, while producers, to date, may have the technological skills that are required, but working on content — as opposed to doing typography and layout work — is not part of their job. If the processes in publishing are based on roles, and no longer on functions, such differences no longer apply; in fact, the opposite is the case, such differences need to be overcome. Another aspect of this development is that aggregators come into play as soon as the concepts for product forms are created. The simple result is that the publishing of the future requires working together across the process chain, in order to successfully place the right product forms in the right markets. 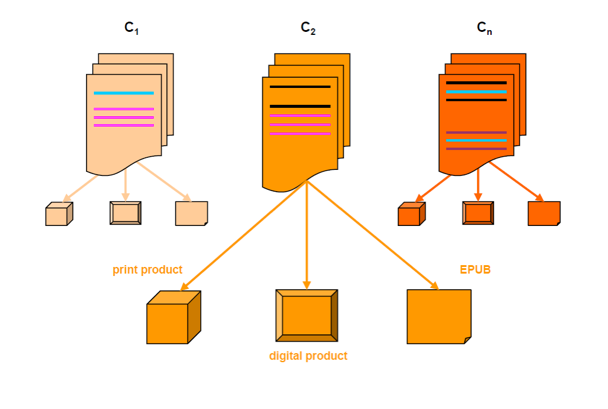 On this conceptual product level, we should differentiate between traditional print and new digital product forms, as they have different consequences for the subsequent development of processes. Traditional processes in print, such as sheet-fed and web-fed printing, are not only complemented by state-of-the-art digital print technologies, they are even replaced by such technologies, because modern digital printers are now cost-effective both in terms of quality and speed — even for editions of only a few thousand copies — while, of course, offering the huge advantage of individualization. In contrast to this, purely digital product forms are directly connected to a business model, as this model determines in which form content (in its granular structures) can and should be offered. Such forms can be subscription models via download or access to data that is stored in the cloud. Finally, there is the distribution level, where individual customer relations are organized to form a versatile content basis, be it indirectly via content syndicators or by providing content be it indirectly via content syndicators or directly by providing content in the appropriate usage environment (which, as explained, is possible because the provider has gained profound knowledge about this usage environment). Comprehensive platforms have the additional advantage that they support the finding of content by organizing and providing virtual usage environments that are modeled in tree structures. Now we’re able to describe the new developments as a “networked content provision,” which contains all the elements of a bottom-up development: In contrast to the familiar provision and sale of products based ultimately on market power, the benchmark for market success is now the provision of the satisfying use of the content supplied. Moreover: familiar and unfamiliar user requirements influence the preparation of content from the very beginning. And because, in the digital age, this use can no longer be thought of exclusively as a solitary act, but rather as a networked exchange of and between users, the basis of this type of publishing is broadening — in contrast to traditional publishing. The path from publisher to end-consumer can easily be identified as a publisher’s sphere of activity. The connection of usage (expectations) and the creation and preparation of content is, by contrast, not as easy to determine. Even the terminology for describing the necessary roles is turned on its head. Customary functions cannot simply be mapped to the new roles. While the creation of content can still be thought of in relation to the author, it must also be taken into account that content from databases can be called up, put together, and, in this way, created on demand. The specific characteristics of such content units remain fundamentally open. Whether text, picture or video, with or without sound, is completely immaterial for the process. The governing requirement is, however, that these content units, whether we call them “items,” “entities” or “chunks,” must be prepared, so that they can be found and used in accordance with expectations. This preparation of the content consists in the identification of the semantically meaningful elements plus of the structure that supports the process of finding and of fast and secure identification. However, it also consists in supporting the production of contextual references, whether with RDF, DBpedia structures or simply with targeted links. And this raises the question of enrichment or enhancement. Reliable market information is necessary so that unnecessary investments are not made. Aggregators and syndicators come into play here, roles which are characterized by special abilities in usage optimization and knowledgeable proximity to user environments. And, finally, the channels which enable the desired usage/need to be supported. It is no coincidence that the term “publishers” is not used here. Of course, traditional publishing is not excluded from the area of business described here, and neither are editors or producers, who will, of course, not be replaced by software. But for the moment, the question of who in publishing (in editorial, in production, etc.) will work where, and in which role precisely, remains open. Another question that remains open for the foreseeable future is whether these people will work in a single organizational structure, or whether there will be new cooperative, project-oriented, organizational entities. It should be noted that the number of self-employed people has been growing dramatically over the past few years. In many cases, the reason was and is the desire to use one’s specific skills and knowledge in an independent and self-determined way, so there is no need to be afraid of the expected transition to new organizational forms. If we go a step further in the examination of the new situations we can expect, we discover that we are dealing with two different areas with regard to content: firstly with creation and preparation and secondly with distribution and use. 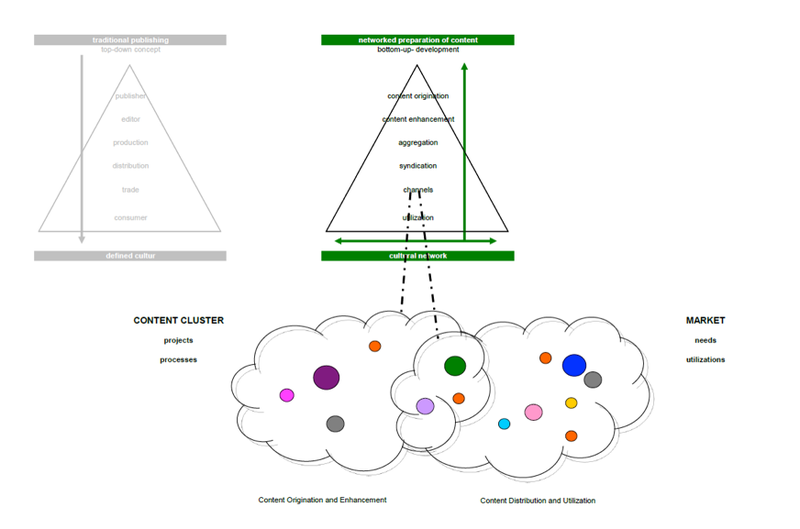 The first can perhaps best be summed up as “content cluster,” the second as “market.” One is provided for the other. Market power is created not by sales strength, but by the quality of usability in non-predetermined user environments. are formed by usage-oriented projects and created in cooperative processes which need to be just as simple as they are targeted. Market is defined by needs which condense into concrete expectations with regard to usage; market success will therefore be produced by the satisfaction of needs and the fulfillment of expectations. This relationship could also be described as value, which is, of course, a prerequisite for monetization. Creating promising connections between the two worlds requires the organization of functions which, as roles, are lacking a stable, universally accepted name. This is why only two creative abilities shall be given as examples here: the ability to imagine new product forms (“inventor of product forms”) and the ability to sense the need for usage (“perceiver of needs”) in order to open it up for realization. In this way, the functions of networked content provision can be established in a combination of both worlds. It is only natural that traditional publishing is pushed into the background. It won’t simply disappear, but will either — following the high-risk American model — become more strongly sales- and bestseller-oriented or take place in high quality niches. Because this is the effect of digitization today: quality is experiencing a renaissance in a variety of physical and digital forms, but also with an awareness that users are prepared to reward quality — that is: to pay for it. The fundamental change will be that traditional publishing will play a part in “networked content provision,” and it will be an integral component of a developing market. I talked about “usage environments” and explained why content is valuable if it is successfully used in such environments, i.e. in a way that benefits the user. As I get into specifics, I intend to use the term “context” exactly in this meaning. To explain this, let’s take a common word like “automobile.” Which context — with no claim to completeness — can we imagine, if the usage environment is that using an automobile, people want to travel long distances, i.e. be mobile? Different interests — i.e. different usage environments — mean that for some people, some contexts are more relevant than others, depending on these different interests. For content providers, an optimal positioning within these contexts is critical. This positioning should happen when content is created, or, at the latest, when content is prepared and structured by adding semantic metadata. This metadata helps content to be found, which is a vital precondition for meeting customer usage expectations/needs. But how can the appropriate usage environment of a customer — of someone who searches for valuable content — be taken into account? Matching the appropriate usage environment is the most important factor in enabling the successful use of content. Can content providers contribute to this factor in an early stage? Let’s assume that the author and editorial department are preparing and structuring content for a practical guide called ”Mobile on Four Wheels.” It is obvious that everybody who is working on this needs to know as much as possible about the most likely usage environments of “automobile” and “mobility.” It is vital to prepare the content by identifying suitable areas of focus and (perhaps) by adding content units that are missing or linking to them — of course prior to making the content for ‘Mobile on Four Wheels’ available online. This provider’s perspective of the context of the content has a direct effect on the successful use of the content and on customer satisfaction in this specific market segment. The illustration below is an example of how this could be done. By contrast, usage perspectives are created individually by the user, uninfluenced by the provider, when searching for content which meets their specific, individual needs. The content provider needs to provide proactive support to ensure the search will be successful. This means that appropriate content created and prepared by the provider should appear in the search results list in a relevant position, and this content should clearly indicate and provide further information, which helps getting a successful, satisfying search result. 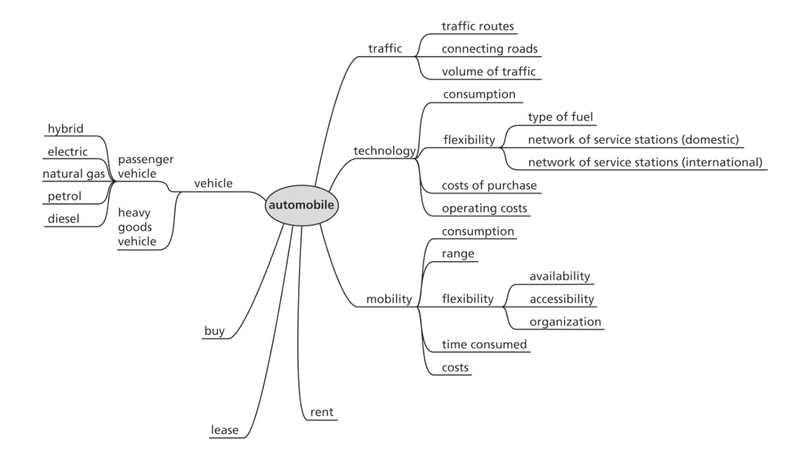 Let’s assume that the user is particularly concerned about flexibility when using an automobile, so he focuses his search on “flexibility” in the context of “automobile” and “mobility.” Flexibility is facilitated, whether the user is buying, leasing or renting an automobile, whether the automobile consumes diesel or electricity, as long as he is aware of the limitations imposed by his selection. 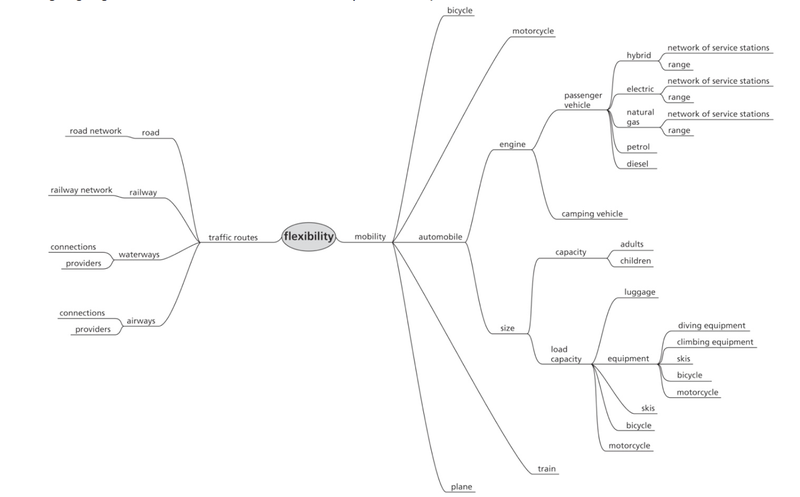 If, as a user, “flexibility” is the most important aspect of my search, I will discover that there are other options than using an “automobile,” and that “automobile” is an option which is linked to the transport route “road.” It will also be clear which other means of transport enable mobility, from bicycle to airplane, and what their limitations are. An important factor of the usage environment may be, as listed here, the engine system of the vehicle, as well as its characteristics, and another factor could be its size and/or the options for carrying/transporting goods. It could also be relevant for the user that some elements (of transporting goods) are part of a vehicle’s (optional and permissible) load capacity, whereas they could also be part of the equipment transported by using the vehicle — this could have an impact on the degree/level of mobility provided be the vehicle. As long as content providers are unable to automatically and reliably prepare and structure any type of content by utilizing semantic technologies, search trees are indispensable for supporting the user in his usage environment. Synonym and similarity searches are becoming increasingly popular these days. They are semantically justified steps on the way to taxonomies and ontologies, so they always have to be regarded (and utilized) as learning systems. The reason is that, for these types of searches, language/words and meaning, i.e. the signifier and the signified, are in a constant state of change and development, so these types of searches can only be helpful tools if they are always up to date and constantly checked for consistency. Helmut von Berg has been a Director at Klopotek & Partner GmbH since 2004. He has hosted the “Forum Herstellung im Verlag” (“Production in Publishing”) conference series since 2005 and initiated the “Publishers’ Forum” in 2009. During his many years managing production and publishing processes, he has held positions such as head of production, material scheduling and purchasing at Droemer Weltbild in Munich and head of production at Droemer Knaur and Walter de Gruyter. He is active as a consultant for business process analysis and is co-coordinator of the Frankfurt Book Fair’s “Forum Production in Publishing” (“Forum Verlagsherstellung”). 1: However, an article on the English Siemens website argues that helpful search engine results are even possible today, despite lacking semantic depth.